While checking out one of my favorite blogs, I bookmarked a recipe that I knew would come in handy once the School Year Rush kicked in. Diannes Dishes is a great source of inspiration. In fact, her Goat Cheese and Tomato Omelet is on tap for lunch today! Dianne's Kicked Up Barbecue Chicken looked like a great way to spice up an ordinary chicken dinner. Quick to make and simple to prepare, this recipe was perfect for a hectic night following a cross country meet when dinner needs to be ready *now*. You simple grill a chicken breast seasoned with salt and pepper. When it's about done, brush on some BBQ sauce and let heat through. Top with cheese, bacon and scallions and you have a festive dinner. This night I paired it with Ina Garten's Grown Up Mac and Cheese that I blogged about yesterday. Kicked Up Barbecue Chicken is great on a weeknight or even for entertaining with friends. 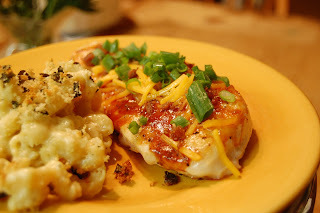 Bake chicken breast for 20-25 minutes until done through. Remove from oven and brush with barbeque sauce. Return to oven for 5 additional minutes. Once chicken is done and barbeque sauce is heated remove from oven and place chicken breast on a plate. Top with shredded cheese, bacon and scallions. Serve immediately. I love a great bbq - this chicken looks great - and those pics...incredible!